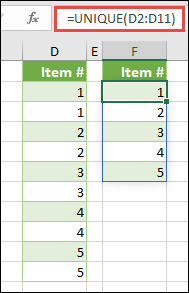 The UNIQUE function returns a list of unique values in a list or range. Note: September 24, 2018: The UNIQUE function is one of several beta features, and currently only available to a portion of Office Insiders at this time. We'll continue to optimize these features over the next several months. When they're ready, we'll release them to all Office Insiders, and Office 365 subscribers. An array can be thought of as a row of values, a column of values, or a combination of rows and columns of values. In the example above, the array for our UNIQUE formula is range D2:D11. The UNIQUE function will return an array, which will spill if it's the final result of a formula. This means that Excel will dynamically create the appropriate sized array range when you press ENTER. If your supporting data is in an Excel Table, then the array will automatically resize as you add or remove data from your array range if you're using Structured References. For more details, see this article on Spilled Array Behavior. You can download a workbook with UNIQUE function examples.